To yield quality sequencing data on the initial reaction (i.e. without having to repeat reactions which result in delay), your submitted sample(s) must meet our DNA Sample Submission Requirements. A failure to conform with these minimum requirements as set forth below, may render ACGT’s performance of service(s) behind our turnaround time schedule and/or order completion unattainable. Template DNA should be eluted in de-ionized water and not in elution buffer. Elution buffer will result in “noisy” or unusable data. For LCO service, the template should be premixed with only one primer per tube. Example: If a template must be analyzed in both directions using the LCO service, pre-mix the template with forward primer in one tube and with the reverse primer in another tube. We require a minimum of 10ul of sample per reaction irrespective of the service used. For Standard and Premium services we require a minimum of 7ul of primer per reaction. Samples should be submitted in 1.5ml or 0.5ml microfuge tubes with the appropriate amount of template and primer. For High Throughput orders, please submit samples in 96 well plates or strip tubes with DETACHABLE caps. NOTE: Please do not use the Premium/Standard table to determine the concentration and volume for LCO orders. For example, if you have a plasmid at 100ng/ul, please dilute down to 20ng/ul. Mix 10ul of this plasmid at a concentration of 20ng/ul and 2ul of primer at a concentration of 10pmol/ul in a single tube. Correspondingly, PCR products must be diluted down to the concentration provided above, and then premixed with primers. We recommend using fluorometric methods to determine concentration of DNA and nanodrop results to determine purity. For smaller PCR products please ensure a single band is present on agarose gel. If you are using an ACGT universal primer, you may send only the templates optimized at the concentration provided above. ACGT will then add the primers for you. If, however, a universal primer has already been added, please indicate this in the additional comments section on our online order form. Banked primers cannot be used for this service. The amounts provided below are the minimum concentrations required per reaction. To ensure quality results, ACGT strongly advises using the higher end amounts of concentration. For example, if you intend on submitting plasmid A which must be sequenced with one forward and one reverse primer, then the number of reactions required is two. Thus, if the concentration of plasmid A is 25ng/ul, you must send us 20ul. 1. Samples should be submitted in 1.5ml or 0.5ml microfuge tubes with the appropriate amount of template and primer. For High Throughput orders, please submit samples in 96 well plates or strip tubes with DETACHABLE caps. 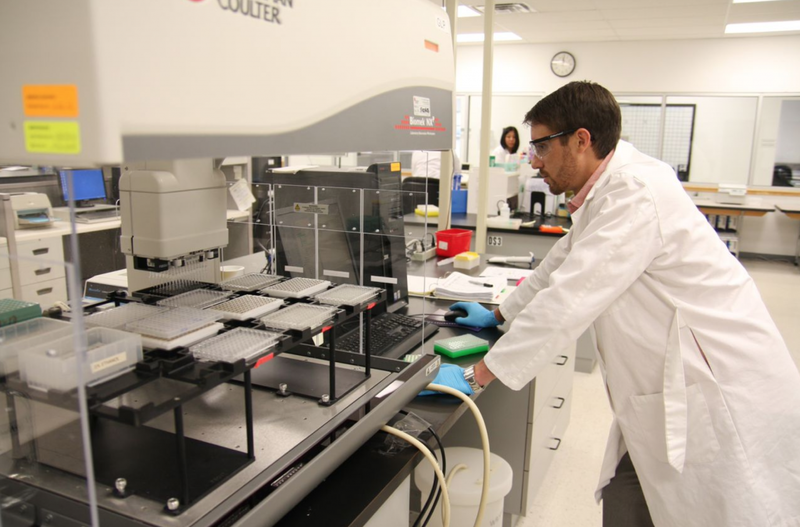 When samples are sent in 96 well plates, the reactions will be performed following A1-H1 orientation unless otherwise specified. 2. Quantitation of template DNA: For the most accurate quantitation, ACGT recommends using gel electrophoresis (where the band intensity of a sample DNA is compared to a standard ladder). For example, the 1.6 kb band of the common Invitrogene 1 KB plus ladder contains 8% of the total amounts of DNA present in the ladder mixture, and can be used as a quick reference for estimating the concentration of your template. We recommend using Nanodrop Spectrophotometer that measures 1 µl samples to check for presence of salt in the samples. OPTIONAL: Please include a gel photograph of the template DNA with the quantity of the DNA loaded including a molecular marker. 3. Important: Elute the template DNA after purification in de-ionized water, not in elution buffer. Buffer components have a tendency to inhibit the sequencing reaction and result in failed runs. 4. Please provide an extra amount of DNA so we have enough samples to repeat a reaction in the event the initial reaction fails. 5. You must accurately indicate the DNA concentration on the order form, especially for Standard service orders. For Premium service orders, DNA sample quality and quantity are randomly checked by Nanodrop or agarose gel electrophoresis. 7. If your DNA sequences include high GC content, hairpin or secondary structures, please select the appropriate protocol on our online order form so we may adjust the sequencing reaction conditions to yield good quality results from the initial run. 8. Please indicate if your DNA was purified by CsCI or large scale purification. 9. If a template must be analyzed in both directions, pre-mixed samples of the template with forward and reverse primers in separate tubes must be submitted. 1. The sample name on the tube and the sample name provided on the order form must be identical. 2. Do not make your sample name too long. Combined template and primer names with more than 23 characters will be automatically truncated. 3. When naming your sample, ACGT accepts only the following symbols: underscores ( _ ) and dashes ( – ). Do not use any other symbols or spaces in the primer and/or template names. 4. If using tubes with screw-on-caps, label both the tube and caps. 5. Use BLACK marker only to label your tubes. Colored markers smear and are difficult to read. 6. Templates and primers should be clearly identified on our online sample submission form. 7. To avoid sample mix-up, different samples submitted in 8-strip microtubes should be clearly indicated or referenced to the corresponding template descriptions. 1. Drop off your sample(s) in a ziplock bag along with the online order number at any one of our convenient dropboxes (if located on onsite at your institution or campus). ACGT accepts samples Monday through Friday from the U.S. Postal Service and all other courier delivery services (e.g. UPS, DHL, FedEx, etc.). ACGT accepts samples on Saturday from FedEx only. To ensure your samples are received on Saturday, please mark “Saturday Delivery” on the FedEx Airbill. Please make sure to indicate the online order number along with the shipment. The processing of samples without a corresponding order number will result in delay. 3. DNA samples in tubes may be shipped at room temperature for overnight delivery. It is not required to send the samples on dry ice or wet ice. 4. Template DNA stored in individual tubes should be capped tightly to prevent accidental spillage or cross contamination. 5. DNA shipped as a pellet can be also shipped at room temperature. 6. Use adequate padding to prevent any damage during shipment. ACGT provides bubble bags free of charge found at any of our dropboxes. 1. 96-well plates should be sealed properly to prevent cross-contamination or evaporation during shipment. ACGT recommends using strip caps to seal plates. Then wrap over with Parafilm to avoid spillage and cross-contamination. High quality heat seals are also recommended. 2. ACGT recommends freezing your plate samples and shipping with dry ice. You may pack the plates (while still frozen on dry ice) in a Styrofoam box. Please ensure there is a sufficiency of dry ice on the top, bottom, and on both sides of the plate(s). 3. If shipping more than one plate, wrap the plates in aluminum foil and/or vinyl tape (not lab tape) so your plates will not shift or move around during shipment. Lab tape tends to become brittle and rip apart when exposed to dry ice. 1. Use a Parafilm wrap on the edges of the plates and place them in the container with the lid side down. Pack with a protective bubble pad. 2. Plates can be shipped at room temperature if not overgrown. 1. Use a Parafilm wrap on the edges of the lawns. 2. Pack agar lawns in a Styrofoam cooler. Plates should be cooled to room temperature to prevent condensation. Once the plates have cooled, place them in the cooler with the lid side down. 3. Place ice packs in the cooler. Do not place ice packs directly on plates as condensation may leak into the plates. Clearly indicate “THIS END UP” with arrows for a proper handling and delivery. 1. Do not overload the Qiagen resin. Usually, a poor yield of plasmid DNA results, presumably due to competition with RNA fragments for binding to the Qiagen resin. 2. Use the recommended quantity of LB (not Terrific broth) for cell growth. 3. Wash the DNA pellet at least once as directed with 70% ethanol. 4. Residual salt in the final template will interfere with the activity of Taq polymerase resulting in sequence data which extends fewer than 200 bases from the primer and exhibits a low signal to noise ratio. 5. Dry the template DNA completely. Residual ethanol is detrimental to Taq cycle sequencing resulting in data with a drastically reduced signal. 6. To remove residual ethanol, dry the DNA for 5 min. in a properly operating speedvac. 8. When air drying, a brief 15 min incubation of the open tube at 65°C is often sufficient to completely dry the DNA. 1. It is critical that the plasmid template is free of any contaminants including buffers, salts, organics, and proteins. 2. Submit DNA in deionized water, not in TE. Buffer components inhibit the sequencing reaction and cause failed runs. 3. If possible, use of phenol or chloroform during the purification procedures should be avoided. An additional ethanol precipitation is recommended if phenol or chloroform is used. 4. DNA should give an OD260/280 of between 1.7-1.9 and an OD260/230 of about 2 to 2.2. Low 260/280 indicates protein contamination, high OD260/280 ration indicates presence of salt contamination. 5. If your PCR amplification procedure generates a product with a single robust band, column purification will suffice. If it generates multiple bands, gel purification of the band with the desired size is required. We recommend using gel electrophoresis, where the band intensity of a sample DNA is compared to a standard ladder, as the most accurate quantitation. For example, the 1.6 kb band of the invitrogene’s 1 KB plus ladder contains 8% of total amounts of DNA presents in the ladder mixture, and can be used as quick reference for estimating the concentration of your template. We also recommend using Nanodrop Spectrophotometer that measures 1 µl samples with high accuracy and reproducibility. It is essential that the DNA is free of contaminants, unused primers or dNTPs. PCR templates that do not undergo any kind of post PCR clean up are not suitable for sequencing and will yield unusable sequence data. It is highly recommended that your PCR template is first checked on a gel to confirm that there is a specific product with the correct size. The EXO/SAP protocol to clean the PCR amplicon frequently damages the PCR primer attachment sites. We recommend that internal primers are used for sequencing because it lowers the risk of poor sequencing results due to the damaged PCR primer attachment site. 4. Tm of ~56-62°C. Avoid low Tm (i.e. 40-45°C) If Tm is low, make the primer longer. 5. Length of primer should be 18-23bps. 6. GC “clamp” on the 3′ end. 8. Avoid strings of four or more of the same base if possible. The host strain used for a specific template preparation can impact template quality. Please note the following. 1. DH5 alpha host strains consistently produce good results. 2. HB101, MV1190, JM109 and XL1 Blue host strains show some variability in result quality. XL1 Blue grows slower than most strains and can lead to decreased DNA yields and it does not respond well to TB as other strains. 3. JM101 (JM 100 series) is not recommended. 4. Avoid Terrific broth and other rich media. 5. Avoid host strains TG1 and TG2 which contain high carbohydrate levels.